Boyds Mills Press, 9781620916278, 32pp. Nature's repeating patterns, better known as fractals, are beautiful, universal, and explain much about how things grow. Fractals can also be quantified mathematically. Here is an elegant introduction to fractals through examples that can be seen in parks, rivers, and our very own backyards. 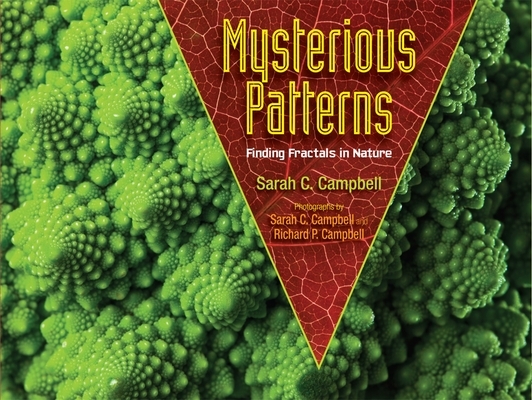 Readers will be fascinated to learn that broccoli florets are fractals—just like mountain ranges, river systems, and trees—and will share in the wonder of math as it is reflected in the world around us. Perfect for any elementary school classroom or library, Mysterious Patterns is an exciting interdisciplinary introduction to repeating patterns. Sarah C. Campbell creates picture books with facts and photographs. Her latest book, Growing Patterns: Fibonacci Numbers in Nature, explains a simple number pattern and explores the ways it shows up in nature. Her first book, Wolfsnail: A Backyard Predator was named a Theodor Seuss Geisel Honor Book and an ALSC Notable Children's Book. She partners with her husband, Richard, to take the photographs for her books. They live with their three sons in Jackson, MS. Visit sarahccampbell.com.